We take 8-10 youth from the Fisantekraal bike club (settlement outside of Cape Town) to the Cederberg Conservation area over a weekend filled with adventure of hiking, rock-climbing and camping in the wilderness . It is a magical mountain area and Pangaea Project support us! Purpose of the trip : To give youth a chance to explore and learn, and not be constrained by money as they grew up in a community that has a lot of problems with crime/drugs. To simply be able to enjoy the beauty of the world and learn more about themselves through hard physical but enjoyable exercise and to teach them life skills that they can apply to their daily lives. This will be an opportunity to go away and escape their daily struggle, to have a chance to simply enjoy nature, a chance most of them would never have. We further want to install leadership qualities that can make a difference in their lives. Fisantekraal is an area just outside of my home town Durbanville, and it consists of mostly low income families that would never be able to afford to go on holiday or have a chance to explore the mountains, even if it is only a 2 hour drive away from their homes due to financial constraints. 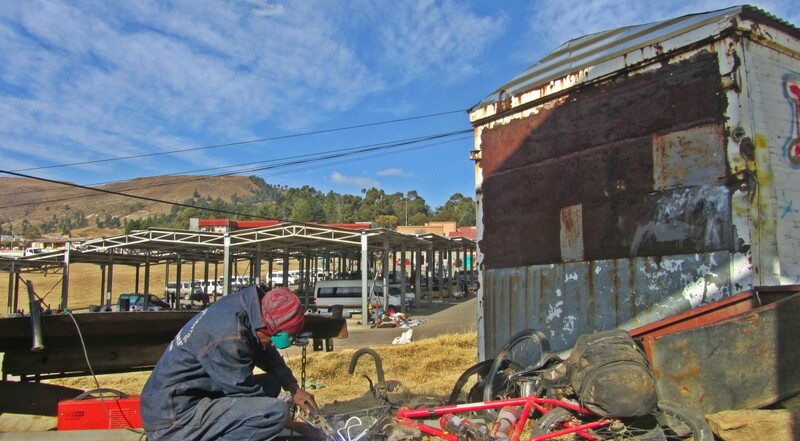 More about Fisantekraal Bike club : “Fisantekraal Bike Club is headed up by bike mechanic and trainer Brenna Coupland who takes groups of students through an eight week programme of breaking down and building up broken bicycles.” .The youth are already at a certain fitness level and capable, and have shown a commitment to their club. The youth that will be given the opportunity to go on the trip will be selected by Brenna Coupland, the only requirement is that they should have shown a interest and commitment toward the Fisantekraal bike club. Some of the youth finished school last year and are currently unemployed, and others are still in school. Friday : Leave Cape Town early morning, and arrive at Cederberg ,Sandrif campsite .Barbeque and visit observatory. Saturday : Hike up to the Wolfberg Arch through the Small crack system. The days activities will be done orienteering style with the leaders only assisting, some of the youth have already learned how to do orienteering and it is a ideal chance that they can teach the other youth, getting everyone more involved. Afterwards, relax and swim at the campsite. Barbeque, bake bread, share stories. Sunday :Visit Stadsaal caves for bushman art , learn about our heritage. Go to Truitjieskraal for rock-climbing. The budget allows to cover the cost of camping and food and fuel for the cars used for the transport of youth. The remaining will divided to contribute to the fuel of the leader’s car. Unfortunately Brenna Coupland of the Cycling club cant join us due to prior commitments. In the end we hope that we can look back and see the difference that has been made, that we could help the youth to make difference in their lives through positive reinforcement, sharing our experience and passing on the knowledge we were fortunate enough to learn in our own lives through adventure ,exploration and studying.